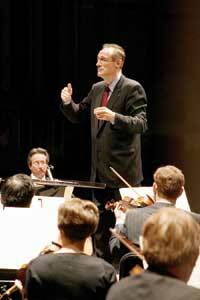 In Like Flynn: Guest conductor Patrick Flynn brings out the best in the symphony. NOW, at the start of its fourth season, it has become obvious that Symphony Silicon Valley gives its best performances when guest conductor Patrick Flynn is on the podium. The triumphant reading of Beethoven's Fifth Symphony on Sunday afternoon showed the orchestra at its best. In this moment of glory, however, it has also reached the point of diminishing returns. For all its abundant talent, this orchestra could, and should, be playing better. And if audiences are to continue to grow, to say nothing of corporate sponsorships, it must. That won't happen under the current management strategy of recycling guest conductors, especially when some come highly qualified while others are not. It comes down to basic human psychology. The musicians know that these guest maestros come with no long-range authority. They know that the symphony's CEO, Andrew Bales, is the ultimate boss. They further know that Bales is no musician and will never fully understand what they do, or how to motivate them to improve. What are the problems? Basically, deficiencies of discipline—both individual as well as the notorious bugaboo of musicians not listening to one another. The fairy-dust music of the opening piece—Mendelssohn's Midsummer Night's Dream overture—found the violins in messy articulation and in dubious tune. For all its ultimate impact, the Beethoven suffered from too many ragged attacks. The brass need choir lessons. At times it sounds as if some of the players think their contribution is good enough. It isn't, and it spoils what the others are working hard to do. Whether Bales hears this or not, every guest conductor does. Given the proper authority, any conductor worth his or her salt would set about the task of getting this orchestra up to the excellent work of which it is capable. Under Flynn's inspiration the orchestra came alive, came back to its real best. In the last movement of the Mendelssohn—the Scherzo—the elfin magic finally captivated the violins. As the Beethoven progressed, the playing got better and better until a kind of bonfire took over like an irresistible force of nature. How often can you say that about such an overexposed warhorse? For my time and money, Flynn squeezes more juice and plumbs more soul than either of those high-priced, overmarketed podium princes at the San Francisco Symphony and the Los Angeles Philharmonic. He has an instinct for phrase, pace and balance that inspires intimacy and grandeur in similar measure. These same dynamics ignited the fabulous Leonard Bernstein score On the Waterfront, cobbled from the music written originally for the Elia Kazan film. I could further rave about it if space permitted. Finally, after the Beethoven, Flynn came up with a cheeky encore, a bit from Walton's Facade that recycled from the Bernstein players my favorite saxophonist, Bill Trimble, who otherwise could have driven home an hour earlier. Symphony Silicon Valley needs an empowered music director. Lacking one—I say with great respect and admiration for the musicians—excellence will not replace "good enough."